When a demolition crew uncovered a roughly century-old advertisement in downtown Paducah a couple of years ago, it sparked our thoughts about the importance of historical murals painted on our buildings. The ad was for Dr. Bell's Pine Tar Honey and featured spokesperson Granny Metcalfe. 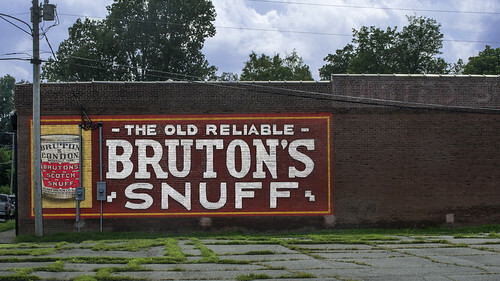 Other examples of advertising exist downtown, but many of them are faded or nearly gone. These are our ghost signs. The Pine Tar Honey ad at 126 North 3rd was no ghost sign. It was fairly well-preserved, being hidden from view for decades by the building next door. The staff at Innovations Branding House discussed the uncovered art in passing and wondered what other downtown advertisements looked like their heyday. Using the tools at their disposal, they decided to photograph many of them and recreate them digitally. "It was water cooler talk," says Todd Duff, owner of Innovations Branding House. "Someone would say, 'Hey did you know there was old sign here or over there?' You don't always see them. They are kind of like Easter eggs with a glimpse into our history. That's the appeal. And it aligns with what we do—commercial art. So we were naturally interested." Austin Madding, Innovations Branding House graphic designer, researched ads correlating to Paducah's ghost signs. "Sometimes you don't have much to go on," says Austin. "But if we find ads similar to what we're looking at, we can figure out content. It is interesting to see what the priorities were to an ad designer in the time they were made. And the hand-made element appeals to me. There's more feeling to it. This was somebody, with care, doing this at on a large scale." "And it was wild how some of these were done," adds Todd. "I heard that in order to save money and time, some of these guys tied rope around their ankles and were suspended from the top of the building." 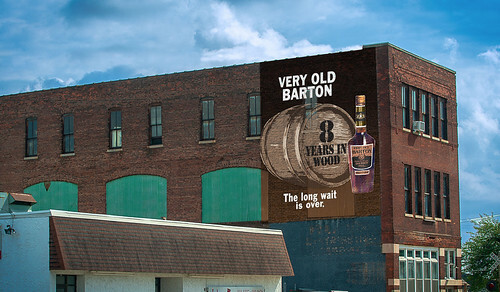 Some, such as the Very Old Barton ad on the building near the corner of Jefferson and N. 11th Streets, were still visible and somewhat easy to reproduce. Others, such as the Budweiser banner just a block down near N. 10th St., were more of a challenge. A portion of the original artwork had been preserved better than the rest due to another sign that was attached to the building. Then, at the other end the building, additional artwork had been painted at a later date. This led to a muddled, mismatched ghost sign. "Some of these take a whole lot of detective work!" says Austin. "You had overlapping signs and paint over paint," adds Todd. "Plus we discovered it was mostly red, which, for some reason, red paint faded a lot quicker than other colors. So getting the design down along with the colors can be challenging." 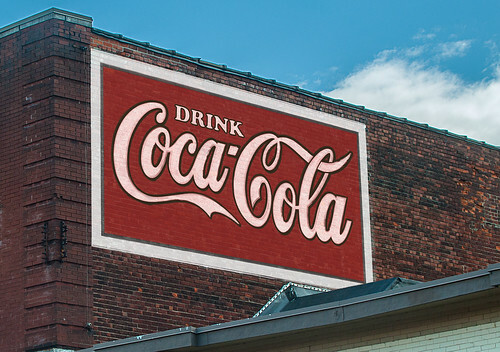 One of their favorites is a simple Coca-Cola sign painted at the top of a building just behind the Columbia Theatre. "At first, it seems like an odd placement," says Todd. "But then you realize that the Arcade Theatre was right there, and they started by showing movies on the rooftop. So you probably had the screen, and then to the side was an advertisement telling you what you should drink." It is art such as the Coca-Cola sign that spark the imagination to envision early movie patrons sitting on a roof-top, sipping on soda, and enjoying the revolution of moving pictures. Other ads conjure up images of river travelers docking in Paducah and seeing suggestions on what whisky or beer to drink while in town. Some recall once thriving companies and stores who boldly let their presence be known to all who passed their buildings. "Now we think, what's next?" says Todd. "In redoing them, they have to be professionally done. You can't just slap some paint on to 'freshen them up.' So if any are to be restored, they have to be done with care. "And we're going to have a resource where people can take a tour and see these signs. It will give some history and put them into context. It will make a very nice walking tour and help connect where we are with where we have been." To see examples of digitally restored ghost signs and keep up with new discoveries, follow Innovations Branding House on Facebook and Instagram.